Minister reiterates govt's policies. Ravi Philemon. 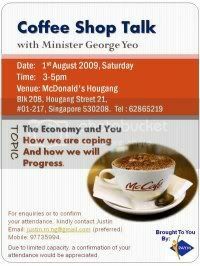 The flyer hyped it as “Coffee Shop Talk with Minister George Yeo” and the talk was supposed to be on the title, “The Economy and You – How we are coping and how we will progress”. I went to the “talk” about 15 minutes late, only to find the Minister being flanked by a grassroots leader who actually looked more like a bodyguard. He also tried to play the role of a moderator. When I arrived the Minister was saying that Singaporeans should create new opportunities outside the United States of America (USA) and ride on the organic growth of China and India. He said that although the economies of Singapore, Malaysia and Thailand were contracting, the economies of the other South East Asian (SEA) countries were growing at a rate of about 7% a year. That combined China, India and SEA had a population of more than 2.6 billion people and that Singapore should seize geographical and cultural advantage to build new links with these economies, including the Middle-east countries, while we keep our traditional links with the United States and Europe vibrant. He said that the “keynesian global paradox” is that those in the USA should save more and spend less, while those in Asia should spend more and save less. He said that it is because we have built these ties with India, China and other SEA countries, that people from these countries feel very comfortable to come to Singapore to do business, and to live and study here. In response to this, one teacher from Temasek Junior College, Yi Jin, recounted that although the migrants from the other countries may feel very comfortable coming here, there is an undercurrent of not being able to integrate with Singaporeans. He related that even in his junior college the foreign students mostly clumped together because even if they may be Chinese, they are not Singaporean Chinese and their cultures are actually very different. To this, Mr. Yeo reiterated that people have a tendency to clump together. He recounted his experience from his student days in England, where the students from Singapore always slumped together. And that it is actually the Singaporean’s job to make the foreigner feel at home by reaching out to them. At this juncture, I shared that it is one thing to accept foreigners, but quite another to accept foreigners at the expense of Singaporeans. I affirmed Yi Jin’s point and said that we should have policies to protect Singaporean workers. I said that the quota policy implemented by the Ministry of Manpower, which enables an organisation to hire 25% of foreign workers, from their total workfore. I recounted that this may unfairly disadvantage the Singaporean worker and asked that the Canadian model be considered. Over there, the Human Resources and Skills Development Canada (HRSDC), a department of the Government of Canada, stipulates that the employer has to satisfy the department that it is unable to hire a local person, before he is allowed to hire a foreigner. This condition does not apply to certain jobs where low-skilled workers are required, where the employers can hire as many foreigners as they want. 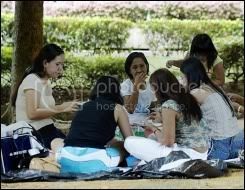 The locals are protected in this instance by living wage policy; which ensures that the local low-skilled are not unduly discriminated against by the foreign workers, who may ask a lower salary. Such equal and living wage policy actually provide better incentives for the employer to try and hire the local first as he would not have to provide for accommodation and other related expenses that he would have to provide for the foreign worker. To this, Mr. Yeo said that the Singapore government’s policies are actually very selfish policies, to benefit the Singaporean. He said that the Singaporean workers are protected to a point in Singapore and said that there are other policies besides the quota policy, which protects the Singaporean worker. Mr Yeo insisted that complex policies actually create more bureaucracies and that he felt that it is better to make a general rule and let the corporations make the actual decisions on who to hire and who not to. He said that the reality is the night shift in many manufacturing companies is staffed by foreign workers because Singaporean workers do not want to do the graveyard shift. “In trying to over protect,”, Mr Yeo said, “we may lose everything”. I replied that the graveyard shift is probably staffed by more foreigners than locals because the foreigners do not have families and children here that they would need to take care of; and said that though I am not anti-foreigner, the quota policy may actually disadvantage the professionals, managers, executives and technicians (PMETs) more than the low-skilled workers. This is because the quota specifies that 25% of the workforce can be foreigners regardless of whether there are local talents to fill the vacancy or not. Mr Yeo agreed that PMETs need to be better protected but reiterated that “you need to strike a balance”. He said that there are many industries and Singaporean entrepreneurs, who are “feeding off the foreigners” and that there are a lot of spin-offs. There was another interesting question from the floor where a person said that the Muslims seem to have lower skills and are hence in low paying jobs. 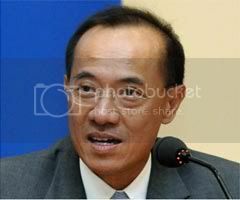 To this, the Minister replied that the Malays actually preferred to work in government jobs and as security guards, while the Chinese want to see instant profits and hence are not keen on such jobs. 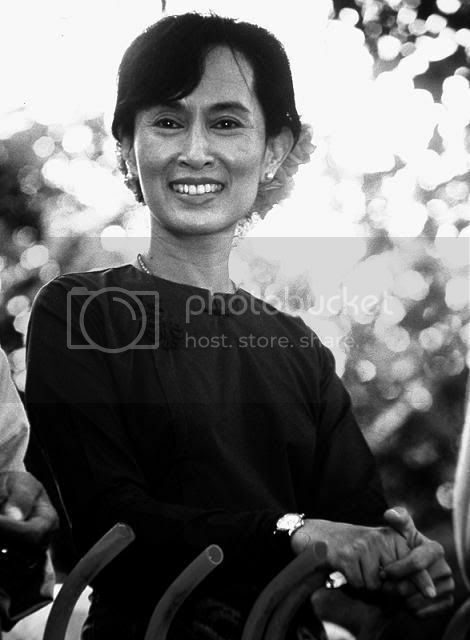 The focus then shifted to ASEAN and Daw Aung San Suu Kyi. Mr. George Yeo said “it is very sad that she has been imprisoned for so many years.” But he was quick to add that we must not oversimplify the problems in Burma. He felt that as the country was very complex in its make up with the Burmese making up only about 50% of the total population of the entire population of Burma, only the military could hold the entire country together. He added that it was the military that had ruled Burma from independence and that it was Aung San Suu Kyi’s father, General Aung San, that was the original military man that had ruled the country since independence. He said that it was also General Aung San created the rule that a Burmese who married a foreigner cannot rule the country and that now Aung San Suu Kyi is married to a foreigner. Mr Yeo said it was because her husband is a foreigner and from the ‘western world’ that the ‘western world’ has come to support Aung San Suu Kyi and have failed to recognise the rule of the military. The problem in Burma is actually “a very deep family dispute”, he said, and the road to democracy for Burma is long and that the elections next year is but a small step towards that goal. He said that ASEAN has worked well in keeping the peace in this region, in subjecting the member nations to peer pressure and in trying to forge economic integration. Another teacher from the floor then brought out the topic of race stereotypes in schools and mentioned how children learn from parents and form prejudices and even make nasty remarks to those of the other race in the schools. She asked what policy the government may have to initiate to overcome this bias. The minister admitted that values are transmitted from parents to children, that it is very difficult to change prejudices and that there is only that much that the government can do but added, “We are better off than others (countries)”. The coffee talk ended with a time of refreshments, where I had a chance to engage the minister and say to him that although I did not agree with everything he said, I appreciated his sincerity in trying to reach the ordinary Singaporean. The Minister asked which parts I did not agree with, to which I replied that one is the question of race and how the right question to ask would be not which policies you would devise to counter the biases and prejudices among the races; but which policy you would do away with. I said that I would do away with the Chinese, Malay, Indian, Others (CMIO) policy as this policy was the main ‘culprit’ in perpetrating racial biases among Singaporeans and prevents the formation of a true Singaporean identity. Later, I chatted with other participants. One of them asked me what I thought about the session. I said that it was a good effort to reach out to the ground but that it was not a dialogue which would have been much more intense. He replied, “This is actually Meet the People Session in McDonald’s”. That probably summed up what the much-hyped Coffee Shop Talk in reality actually is.